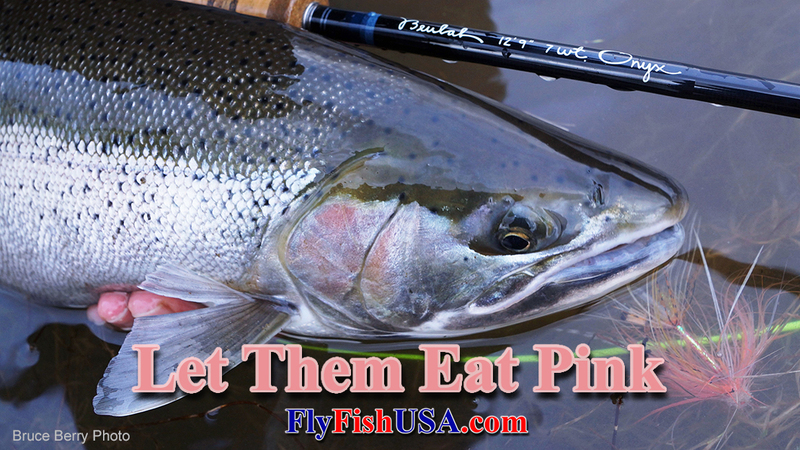 Let Them Eat Pink: pink flies that is! Everything balanced. The rod and reel were a perfect match. I had just changed lines and had to speed up the rod tip slightly because this line was a little lighter in weight than the last one. The ideal stroke length got a little shorter, the power backed off a little and the rod tip deflected a little less. The stop at the end of the stroke became a little more abrupt. The vibrations in the rod decreased as the stroke smoothed out. Standing waves in the forward cast disappeared, Both legs of the loop were totally parallel, about a foot and a half apart. The momentum of the cast died at exactly the same instant that the leader turned over. There was no slack, and no bounce back. The line landed like a chalk string, at exactly the right angle to the current. The fly landed exactly on the seam between the fast mid-current and the slightly softer inside. 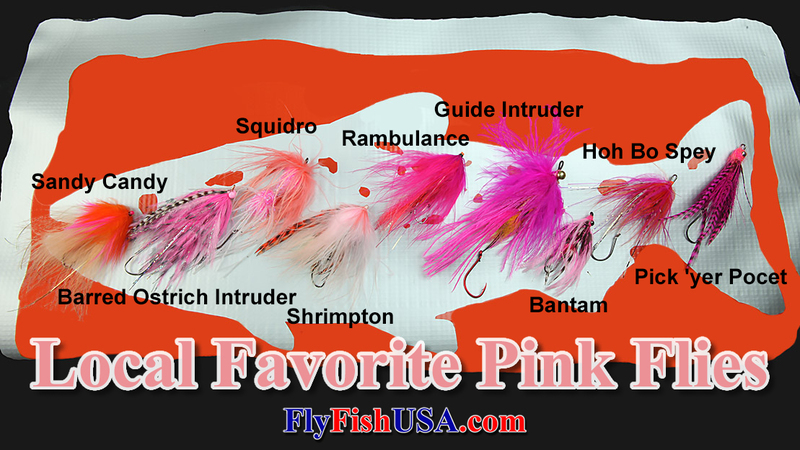 The rod tip was lowered and the sinking tip slid beneath the surface with the beautiful Pink Shrimp Fly in tow. Frank Day had tied that fly while he and I had spent a tying session at the Fly Tyers Rendezvous, November 11. We had discussed the potent pink shrimp population that thrives, just off-shore along the coasts of Washington, Oregon and California. We wondered if steelhead fed on them when entering coastal water. 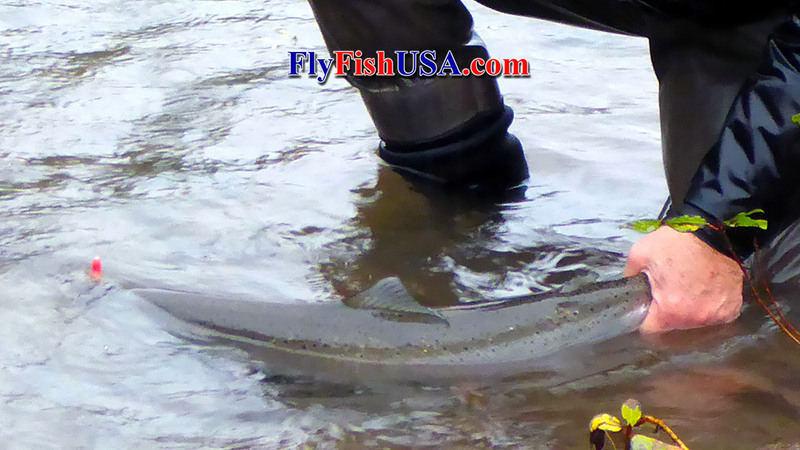 I relayed some of my experiences of fresh steelhead liking pink flies early in the winter season. He instantly conjured up a compelling fly complete with shrimpy protruding eyes on the end of monofilament stalks. Now it rode on the end of my leader. I had already fished this part of the run an hour ago with a floating head. Now I plied the same water with a multi density head, which allowed me to fish the fly a little slower and discernibly deeper. The strike was soft, but deliberate. The fight was dogged and strong. The Fish was an average size female dressed in polished silver. Some things are just more fun than others. Fresh adult steelhead often reenter their natal waters with the memories of their saltwater prey indelibly etched on their tiny little minds. Along the Pacific Coast of Oregon & Washington during the winter (December-March) months there is a dense population of pinkish colored cocktail shrimp. Winter is when they reproduce. These shrimp are often found in near-shore waters over the continental shelf. And the shrimp live in the deep ocean during the day and migrate to the surface during the night. This is a feature of the life style of many ocean critters. Could this account for the fact that steelhead are often much more active during low light conditions? But, then so are most of the prey critters in both freshwater and saltwater environments. 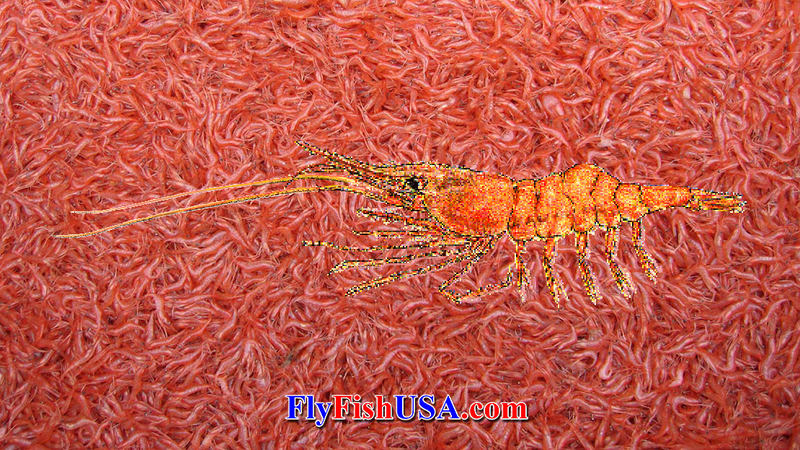 Although many shrimp species are found in waters off Oregon, the pink shrimp also known as the Northern Ocean Shrimp (Pandalus jordani) is the only one found in quantities large enough to be commercially harvested. Pink shrimp have been harvested in Oregon since 1957. Populations vary widely from year to year, which is common for many short-lived crustaceans. Landings in 2005 were 15 million pounds and have averaged 26 million pounds per year over the last 31 years. World wide there are many species of pink shrimps because the food they eat is rich in carotene which are photosynthetic pigments produced by some plants. Depending on the concentrations carotene, it may reflect light red, orange or light yellow colors. Concentrations of carotene may vary in different parts of an animal's body and give it a multi-hued effect. Pandalus jordani is regarded to be uniform in color. The shrimps in the illustrations above are dead and may only approximate the colors of the live ones. The flies that have worked best for me have been pinkish orange in color. For whatever reasons, it seems that true pink (light red) seems to work best in clearer water and orange (red diluted with yellow) works better as the water gets cloudier. The local pink shrimp is small in comparison to many shrimp and prawns seen in supermarkets and restaurants. The market category for pink shrimp is often referred to as "cocktail shrimp", "salad shrimp" or simply "coldwater shrimp". Pink shrimp in Oregon have a life span of only four years and one and two year olds are the most common ages found in the commercial catch. the two steelhead she had hooked. One was a chromer, the other was a kelt.